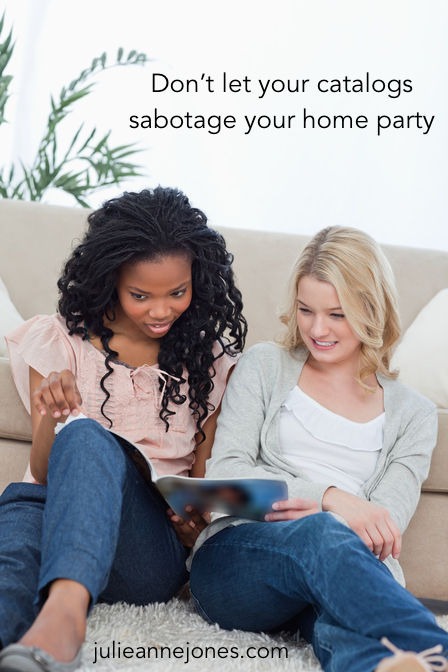 Don’t Let Your Catalogs Sabotage Your Home Party Plan Sales! Today I’m tackling one of those “the way we’ve always done it” topics (as in, “Why do you do it that way? Because it’s the way we’ve always done it”). I want to talk about waiting until the end of your parties to hand out your catalogs. Before you stop reading without even considering this idea, give me a second. If you’ve never considered or tried this, how do you know it’s not a good idea? And why do you think it’s the best idea to hand out catalogs at the beginning of your parties? Because that’s how you learned to do it? Because that’s the way you’ve always done it? I’d like to invite you to consider a different perspective for a moment. If your guests have a catalog in their lap throughout your presentation, they probably feel confident that they’ll remember what they like when it’s time to order. Chances are, there are dozens of pages and hundreds of items in your catalog, so remembering what they specifically like at the end of your party isn’t as easy as it might seem. And since most of us have been taught since we were children not to write in books, they probably won’t mark what they like either. An earmarked page is the best you can hope for, and that doesn’t single out what on those two pages your guest is actually interested in. Consider giving your guests a wish list instead of a catalog at the beginning of your parties. A wish list is simply a place for them to write down anything they like. Unlike an order form, they’re not committed to buy anything they write down, they’re just keeping track. If all they have is a wish list, which is simply a list with spaces to write down the names, catalog page numbers and prices of what they like, they’ll be keeping track as you go through your party of the items they like most (because without a catalog, they’re afraid they’ll forget what they like, so they are more likely to write it down). You can even offer incentives like extra drawing tickets for the first person with 8 items on their wish list. The key is to get them filling this out! Here’s what I love most about this tool. It’s like having a window into your guests minds, because as you sit down to support them with placing their order, you can look and see exactly what they liked. Can you see how this might help you get not only bigger orders, but bookings as well? (“Wow, Audrey, you have ten items on your wish list. I don’t want you to have to pay for all these items! Let’s do a party so you can earn some of this for free!”). There’s no way you can have this conversation if all they’re using is a catalog. Get it? So wait until the end of your party (when you step into the shopping portion of the evening) and then hand out the catalogs. That way, they’ve paid attention to you, they have a full wish list of things they love, and they can focus on what’s in your catalog and add items from that to their wish list as they shop.